Something that I really wanted to start doing on my blog is featuring a bit more about my home city. As a student, most of my time is spent away at university. Whenever I return home there always seems to be a huge amount of new places popping up around the city. So, it felt like a good idea for me to start writing about some of the amazing places in Liverpool at the moment, and put them into their own blog section. I mentioned on Twitter last week that I was wanting to start a new section on my blog and well, this is it! I’m hoping that it might be useful for anyone who fancies taking a trip to Liverpool or maybe inspire locals that haven’t visited my favourite spots to take a trip there. The first of my new favourites and the focus for this post comes in the form of Einstein Bier Haus. 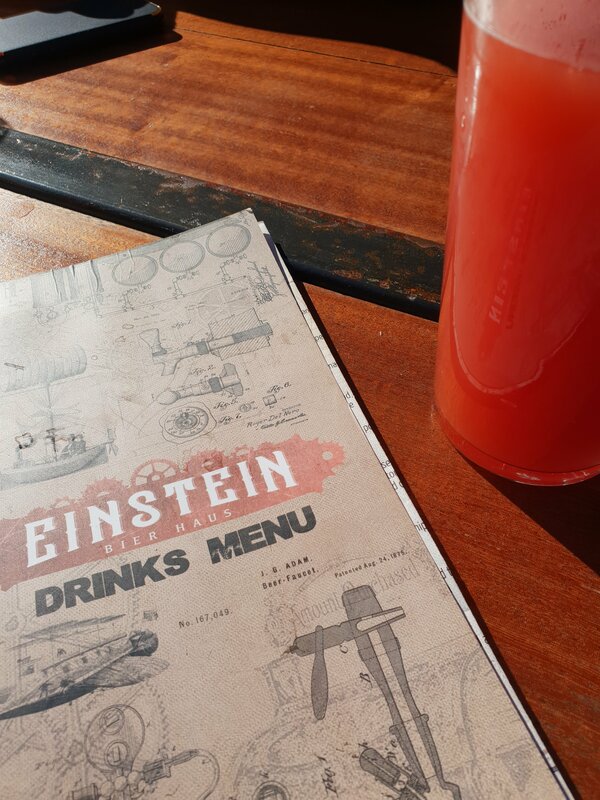 Based in Concert Square in the city centre, Einstein is a two storey warehouse-esque space complete with three main bar areas. There’s food served throughout, flat screen TV’s across the entire space and games such as shuffleboard downstairs as well. But that’s not the best part of the space at all. Upstairs is the outdoor bar space. Over the summer it became a bit of a regular spot for me. I spent a fair few days in the rooftop bar drinking a Friuli or two with my family and it was so beautiful! I’m not sure about any of you but I’m always fascinated by interior design when it comes to finding new spots. A stylish interior always catches my attention and it’s clear to see that Einstein definitely has this. Just look at the women’s toilets! I was completely obsessed with the lighting over the bathroom mirrors and across the rest of the bar as well. I’m such a sucker for a bare-brick wall detail as well (my dream house will definitely have to have exposed brick!) and there’s definitely plenty of it popping up inside the space. Possibly my favourite part of the bar is the fact that they play pretty much all of my favourite songs. If you’ve read my Journey Through My Music Taste post then you’ll know a few of my favourite artists, most of which happen to come on the playlist there! A great playlist is always a bonus when you’re out having a few drinks, and can definitely make my night. Are any of you from Liverpool or have visited the city? Let me know what some of your favourite spots are. I’m always looking for new places to visit when I’m back home. If you have any suggestions then send them my way! I hope you enjoyed this little insight into one of my favourite bars in Liverpool and that you’re as excited as me for more Liverpool-focused blog posts! Wonderful spots! I want to take my mom to Liverpool one day, One day I will! I’ve only ever visited Liverpool once for my Mom’s hen do so I’d love to go again and explore more of the city as I really enjoyed it when we went! The toilets in that bar are another level of amazing, I love those marble worktops I’ve never seen anything like it! Thank youu for sharing! I adore doing posts like this when I lived in Plymouth. It’s really good to share interesting places in your home town. I’ve wanted to go to Liverpool for a while so these posts will help where I need to hit up! Great review and I’m sticking around for future posts like this. This place looks so amazing, and so relaxed! I think I’d love the vibe, and it’s definitely on my list if I ever come to Liverpool! I LOVE THE PHOTOS ON THIS POST! These look like some wonderful places, it’s another city that I haven’t been to but would love to one day! Thanks for sharing them! This seems like a really neat place to visit! I love the decor you pointed out, espechially that lighting!